European markets are all enjoying a healthy start to the year, while US futures have also welcomed the deal. 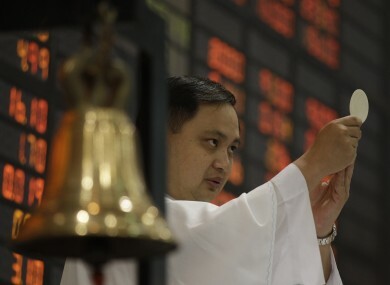 A Catholic priest makes an offertory during a mass before the start of the first day of trading at Philippine Stock Exchange. THE WORLD’S stock markets are enjoying a positive start to 2013, fuelled by the deal that will avoid the United States from going over the ‘fiscal cliff’. Markets in Asia and Europe have all seen good gains on the first full day of trading for 2013, after the House of Representatives followed the Senate in approving a deal to extend tax cuts for middle-class families, though delaying tougher decisions on how to cut back on government spending. In London the FTSE 100 index was up by 2.2 per cent as of 11:30am, while in Paris the CAC 40 was up by 2.3 per cent. Frankfurt’s DAX index was up by 2.1 per cent, and the FTSE MIB in Milan was up by 3.3 per cent. In Dublin, the ISEQ index of Irish shares was up by 1.69 per cent. The European gains followed more modest rises in Asia, where regional economies are in lesser turmoil and where a US economic collapse would have a slightly less profound effect. The Nikkei index in Tokyo rose by 0.7 per cent, while Australia’s ASX 200 jumped by 1.2 per cent. Shanghai’s main index rose by 1.6 per cent. The Hang Seng index in Hong Kong had a more enthusiastic response, however, closing with a gain of 2.9 per cent. US markets are set to open strongly too: Dow Jones Futures point to a gain of 1.34 per cent, with both the S&P 500 and the NASDAQ indices likely to jump by over 1.5 per cent. Email “Stock markets like it when there's no Fiscal Cliff. Who knew?”. Feedback on “Stock markets like it when there's no Fiscal Cliff. Who knew?”.